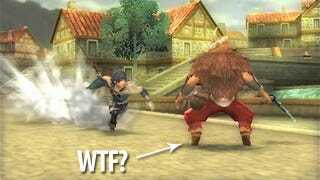 Here at Kotaku, we like Fire Emblem: Awakening. But a while back, we had to ask: Why on earth doesn't anyone in this game have any feet? Everything else about the characters' design is perfectly normal. But they don't have any feet. In a new developer interview posted by Nintendo, the localizers at 8-4 (who were responsible for translating the game's English script) asked Awakening's developers about the feet. They asked about some other stuff, too, but really, the most important question was about the feet. We thought we could make it something that would work well with the characters, but now I'm not so sure. (laughs) So it's hard to give a real reason for it, but...well, I think it's kind of cute, though! (laughs) Isn't it? They look like they're wearing high heels. Aren't high heels the big fashion these days? 8-4: Did you get any feedback about this from Japanese players as well? So, there you have it. They wanted to add a "unique deformation" to the characters… and in the next Fire Emblem game, we can probably expect ankles. Phew.